Please note that Castaway Resort is currently undergoing renovation work. From January to March 2019, building will begin on six new units. Some disturbances may be experienced by guests during these times. 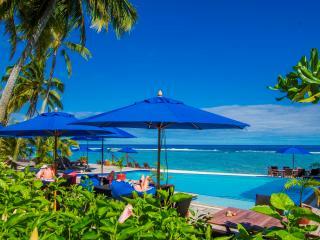 Castaway Resort is a quiet and private adult's only resort located on the western side of Rarotonga. Set right on the edge of the lagoon, this boutique property offers guests beautiful views of the sunset, turquoise lagoon, reef and ocean beyond. Castaway Resort is a convenient 15 minute drive from downtown Rarotonga where you will find an array of affordable restaurants and shopping. There is a bus stop out the front of the resort which will get you into town and around the island with minimal fuss. 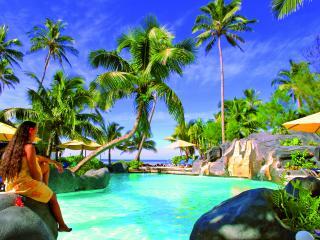 Hire a car or scooter and explore the beauty of Rarotonga for yourself. The main road that circles the island makes it easy to explore the villages and secluded beaches at your own leisure. Castaway Resort offers guests affordable accommodation in 12 studios, villas and suites that all feature their own kitchenettes with small fridge and cooktop. Each has a separate bathroom with shower, WiFi internet access (fees apply), air conditioning and outdoor decks. The resort's onsite facilities include a landscaped swimming pool, Crusoe's Restaurant & Bar, Wilsons Beach Bar, a tour desk, gas BBQ's and picnic tables. Guests have the option of preparing their own meals in their villas, enjoying a self catered sunset bbq, dining by the pool at Crusoe's Restaurant or dining at one of the many restaurants that Rarotonga has to offer. When you stay at Castaway Resort spend your days relaxing by the pool, snorkelling in the sparkling blue lagoon or taking in the beautiful sights of this South Pacific Island paradise. Garden Villa: Spacious villas with separate bathroom and large balcony. Direct easy access to the pool, restaurant and bar. Ground floor villas are set amongst tropical gardens, and upper level villas provide panoramic views of the ocean. Bedding is 1 King Bed OR 2 Single Beds. Maximum room capacity is 2 Adults. Wilson's Beach Bar: Located right on the beach and offers Cuban Cigars and signature cocktails. Open daily. Don't miss happy hour each evening from 3pm! 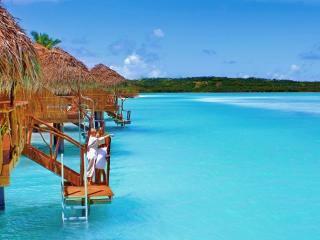 Staying next to the lagoon in comfortable rooms, entertainment and different meals each night, if required. The management are very cooperative and friendly. Great location with excellent snorkelling. Friendly staff who were always helpful. Fresh fruit for breakfast was very enjoyable and coffee great. Good value for money. Would definitely stay there again. Small friendly resort, nothing too much trouble for the hosts. Friendly staff.